Ships tomorrow, 04-25-2019. Choose USPS Priority for delivery in 3-5 days. 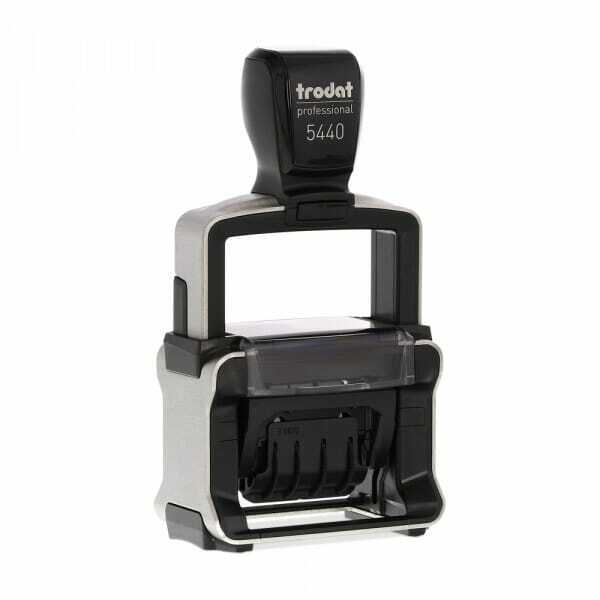 Trodat Printy 5440L comes ready-to-use with 5 frequently needed phrases: RECEIVED, PAID, FAXED, POSTED, _____. Just turn the wheels of the band and select your required phrase. The text prints above the date. The date has the height of 5/32" (3.8 mm) and the format: month (in letters) day and 12 consecutive years in figures. Size of the imprint is 1" x 1-5/8" (24 X 41 mm).. Suitable replacement ink cartridge 6/50/2 is available to further extend the life of your self-inking stamp. Produced climate-neutral with maximum possible use of recycled plastic and compensation of unavoidable CO2 footprint by investment in climate protection projects. Customer evaluation "Trodat Professional 5440/L with 5 interchangeable dies"
Custom Engraved Sign/Desk Holder Complete- Traditional 2" x 8"